In 1929, Walt Disney and composer Carl Stalling collaborated on the creation of a new series for the Disney animation crew: episodic cartoons based around particular melodies, in which the action was driven not by mere dialogue, but largely through musical cues. These Silly Symphonies, as they were christened, were not the immediate hits that the Mickey Mouse cartoons had been; though audiences found the precise synchronization of sound and picture to be appealing, the early Symphonies did not have the draw of the established Disney characters, and the stories themselves tended to be weaker in comparison to those of the Mickey series. In 1932, Disney signed with a new distributor, United Artists, and received a two-fold increase in his per-cartoon budget. With the freedom provided by the sudden influx of money, Disney could afford to experiment and push the boundaries of his studio’s art even further. And in that perfect moment, Disney was presented with a new innovation: three-strip Technicolor. Technicolor had been around since 1916, but in its earliest years, the scope of the technology was limited. The initial form of Technicolor was a two-color system based in red and green, and the process presented a number of technical problems in composing prints. In 1932, the inventors of Technicolor smoothed out previous issues with the process and developed an effective new method that utilized full-spectrum color. Still, they had to find a way to convince the somewhat skeptical movie studios—many of which had cut back on expenses due to the monetary woes of the Depression—to take a chance on the “new” Technicolor. But Disney was willing to take a shot, and United Artists gamely went along with the notion. An almost-completed black-and-white Symphony called Flowers and Trees was chosen for the experiment, and was quickly remade in color. Though the cartoon’s premise was simple—an anthropomorphized forest tableau starring two trees as young lovers whose affair is threatened by a gnarled old stump—the lovely, scenic backdrop provided the perfect opportunity to display the beautiful Technicolor palette in all its multihued glory. But color does not function as a mere novelty in Flowers and Trees; hand-in-hand with the music, the color is utilized precisely by the animators to depict the varying emotional nuances of the cartoon. In the opening scenes, the backgrounds are lovingly rendered in a wash of soft color, setting a gentle tone as the forest awakens; as danger threatens the lovers and the music reaches a feverish crescendo, brighter primary colors become more prevalent, with insistent reds and oranges mixed with the darkness of smoke and ash; after the crisis has been averted, the serenity of the opening scene is restored, complete with a muted pastel rainbow to signal all is well. 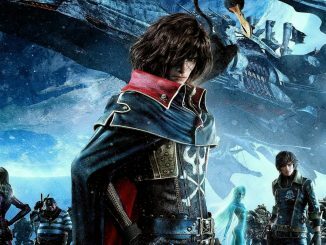 The end result is a remarkable mesh of color and sound, one that truly showed the potential of Technicolor not only as a tool for cartoonists, but for live-action film as well. Indeed, Disney’s success with Flowers and Trees and its successors did much to encourage filmmakers to eventually experiment with the three-strip Technicolor process themselves. 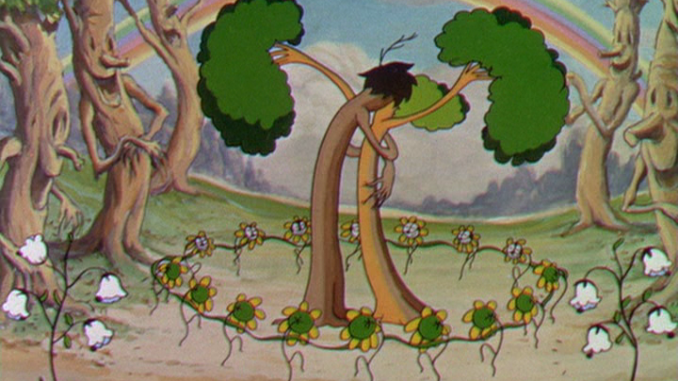 Flowers and Trees made its debut in July, and the cartoon’s success spelled the end of the black-and-white Symphonies. All subsequent cartoons in the series were completed in color (with the exception of Bugs in Love, released three months after Flowers). Though the Mickey Mouse series continued in black-and-white for a couple of years, it too ventured into color with 1935’s The Band Concert. After that cartoon’s success, only two more Mickey shorts were produced in black-and-white before the series switched solely to Technicolor in mid-1935. Though other studios soon scrambled to produce their own color cartoons, none was able to match the massive appeal of the Disney-produced Technicolor shorts. Nor were they initially able to produce cartoons of comparable artistic quality. The ever-canny Walt had made certain to protect his new investment: he signed an exclusive deal with Technicolor that gave his studio sole access to the three-strip process for more than three years. Disney’s competitors were forced to use less effective methods such as Cinecolor in order to keep up with audience demand for color cartoons, and by and large, the results were positively washed-out in comparison to the saturated beauty of the Disney products. Just in time for the fifth Academy Awards ceremony in 1932, The Academy of Motion Pictures Arts and Sciences established an annual award for the best animated short subject cartoon. Flowers and Trees was nominated alongside another Disney short, Mickey’s Orphans, as well as the Warner Bros. cartoon It’s Got Me Again! from the Merrie Melodies series (which was directly inspired by the Silly Symphonies series). Flowers and Trees earned the prize, and Disney animation enjoyed a stranglehold on the category for the rest of the decade. A Silly Symphony won the Academy Award every year except 1938—when Disney’s non-Symphony take on Ferdinand the Bull prevailed—wrapping up its run in 1939 when the final cartoon in the series, The Ugly Duckling, nabbed the award. The Oscar success of the Silly Symphonies would only be matched by MGM’s Tom and Jerry series, which would go on to receive seven Academy Awards of its own over the next two decades. Barrier, Michael. The Animated Man: A Life of Walt Disney. Berkeley: U of California P, 2007. Barrier, Michael. Hollywood Cartoons: American Animation in Its Golden Age. Oxford: Oxford UP, 1999. Maltin, Leonard. Of Mice and Magic: A History of American Animated Cartoons. New York: Penguin, 1987.